In December 1842 the French missionary Rev. Edward Sorin foresaw a powerful force developing if his superior, the Very Reverend Basil Moreau, would allow him to build a university. The university would be located on Notre Dame du Lac, a space given to the church by a bishop under one caveat: build a university there. Those were big hopes indeed. Big hopes that manifested in a well respected university, one that brought a beloved football team and beloved coach in Knute Rockne, and one that continues to progress and grow today. 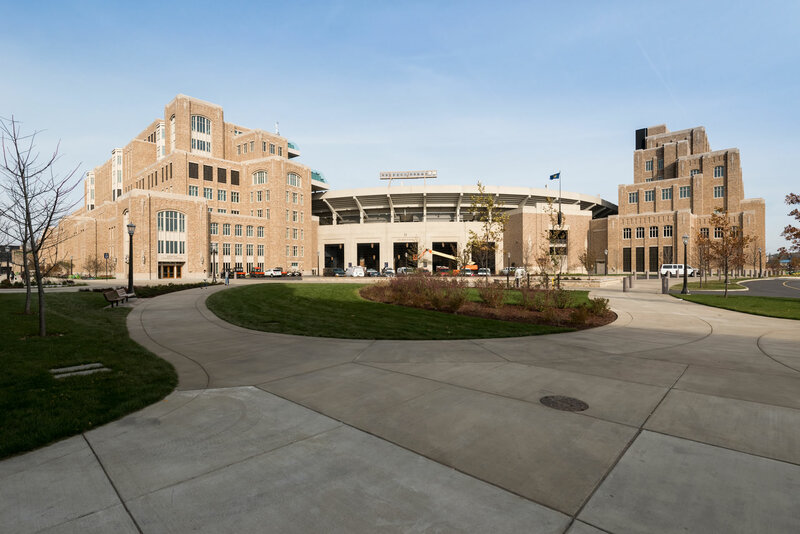 In fact, the University of Notre Dame is applying the finishing touches to what’s the largest construction project ever undertaken in its 175-year history. That’s why this month, MASONRY’s American Treasure column spotlights the university and its much younger football stadium, which was built in 1930. Education is an ever-changing force. More people are earning a college degree than ever before. Universities have to adapt to keep up. That’s what led Thomas G. Burrish, the Charles and Jill Fischer Provost, to realize three important points were compelling the need for exceptional changes and additions to campus. Research and scholarship has grown. “Our external research dollars have doubled. We need new space for the new equipment, the new people, the new studies that are ongoing,” Burrish says in a PBS special. Education and other scholarly programs have also grown. For example, psychology students and faculty have been dispersed among seven buildings around campus. They will soon be gathered in one building, much like the anthropology department, which until this summer had no space to house its three-year-old PhD program. Education and research are becoming more collaborative and multi-disciplinary. Therefore students, faculty, and researchers need space designed for that. Where and how to design the space for all these changes and activities became paramount concerns. They just so happened to dovetail with Vice President and James E. Rhor Director of Athletics Jack Swarbrick’s desire to improve the Notre Dame football team’s home field advantage record, which was one of the worst in college football. The team won 64% of its home teams within the past 14 seasons, according to the PBS special. Swarbrick, in a eureka moment inspired by lots of reading of Notre Dame history, realized that Rockne had placed the stadium off campus. However, it holds a central part in the university’s persona. The issue today, he realized, may have been real estate. In large part, the answer was to bridge the stadium conundrum with the space issue. and the famous football stadium designed by Rockne, the winningest coach in college football history. The changes weren’t all about buildings though. The university showed it had done due diligence to the changes required by adding more than 60 full-time positions and some 765 part-time or on-call seasonal jobs. They might first look at the component of the project that was substantial and revered enough to earn a name of its own: the Campus Crossroads project. This component centered on the stadium, which became a part of the campus like no other university’s in the country. Officials opted to build three edifices into it: O’Neill Hall, Duncan Student Center and Corbett Family Hall. That totalled 800,000 square feet within buildings. 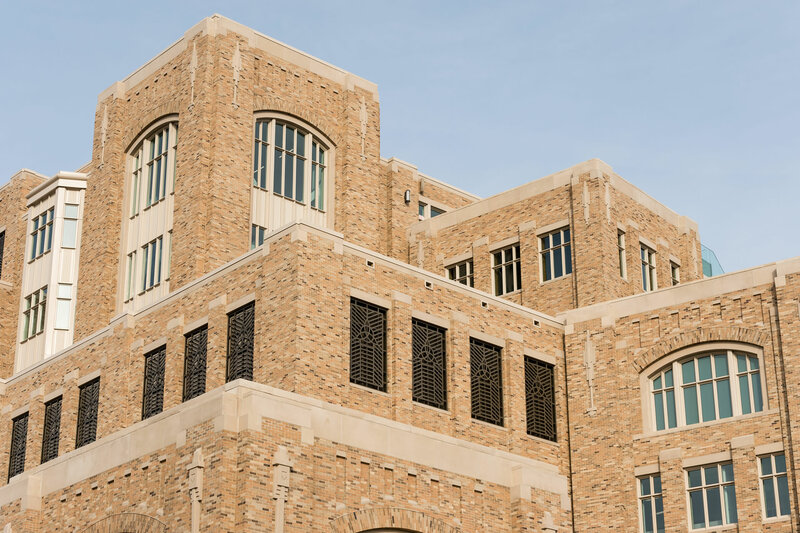 The interiors and exteriors of these new halls perform double duties, serving as space for academic life but also supplementary space for the football stadium. The primary challenge of the Crossroads was adjusting the work to accommodate the school seasons. For instance, six days out of the year crews had to accommodate home football games and commencement ceremonies. That meant all the construction dust and equipment had to be cleaned up and packed way to make the campus as attractive as possible for visiting teams, fans and families. Some 850 tradesmen participated in the $400 million project at its peak, according to Neal Morton, project director with Southfield, Mich.-based general contractor Barton Malow. The project also required 1.7 million bricks and 13,000 tons of structural steel. The buildings’ architecture is a nod to the traditional collegiate Gothic style found throughout the campus. Some 43,000 sq. ft. of the three halls’ habitable flat roof surfaces are covered with living plants as a measure of sustainability that reduces heating and cooling energy loads. These green roofs are expected to be the largest in the state of Indiana and will provide insulation, mitigate stormwater run-off, improve air quality, and reduce noise. They will also conserve rainwater, releasing it back into the atmosphere. The buildings incorporate highly efficient HVAC systems and use geothermal energy. Some other sustainability measures include the diversion of 70% of construction waste from landfills; relocation of 83 trees; installation of composting equipment in the stadium food prep areas; development of program that donates food left over after games to local organizations. These measures were made with the intent to attain LEED Silver certification for the buildings. O’Neill Hall occupies the stadium’s south wall. 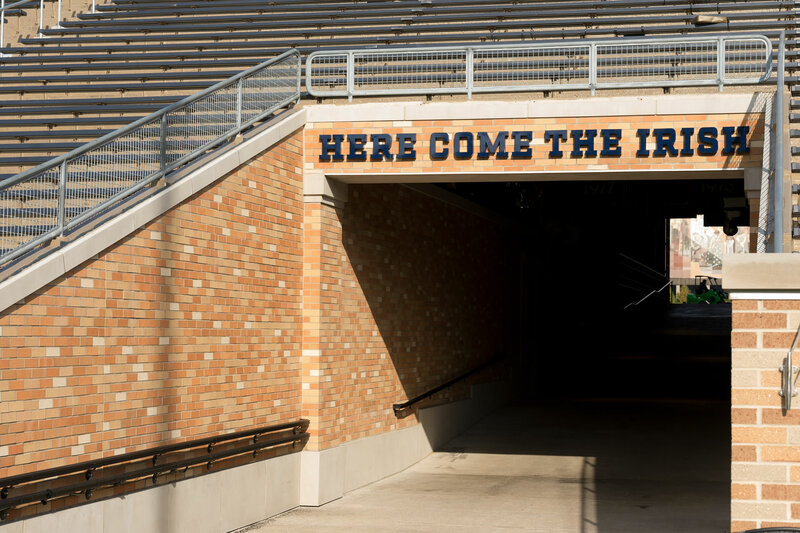 The Fighting Irish makes its grand entrance during home football games through the Frank Leahy Gate located here. One of the exterior walls displays the Diamond Vision high-definition 96-by-54-foot video scoreboard that’s naturally ever-important to game-day crowds. Inside, on the hall’s fourth floor, a club/lounge space offers hospitality during football games, stadium events, and non-stadium related events year-round. O’Neill has more to offer than its relationship to football though. It now contains the Department of Music and Sacred Music at Notre Dame, the latter of which has never had it own dedicated spaces for either rehearsals or performances. Faculty and staff enjoy new classrooms, seminar and rehearsal spaces such as the Michuda Family Rehearsal Hall and a music lab for studio production. The music library has been relocated here from the Hesburgh Library. The space also contains formal performance spaces such as the LaBar Family Recital Hall and the LaBar Family Performance Hall. The nine-story Duncan Student Center takes up residence at the west side of the stadium. Students can enjoy a range of activities here. Some nourish their bodies, such as two new restaurants and a high-end coffee shop. Others prepare them for life after uni such as the Career Center in the fifth floor, which offers 40 interview rooms as well as training and conference areas, study space and increased space for Graduate Student Career Services. What’s more, employment recruiters can now meet with graduating students in designated workspaces. The second floor, meanwhile, houses the Student Media suite, complete with an open television studio, newsrooms and radio studios visible to the public. This floor also contains NDTV, WVFI, WSND, the Dome Yearbook, Scholastic Magazine and Notre Dame’s second oldest publication, the Juggler. A basketball court on the second floor is a prelude to what takes up the third and fourth floors: the Smith Center for Recreational Sports. This space has expanded the amount of recreational fitness space previously available. It features a wider variety and diversity of equipment in addition to expansive programming. The Eldorado Climbing Wall stretches three stories high and is surrounded by a suspended indoor track with views of the campus. Level six hosts mechanical support, and the sixth floor holds a 500-seat student ballroom, club seating for football and booths for NBC Sports telecasts of home football games. The remaining levels feature premium stadium seats and terraces overlooking the campus and playing field, club seating, boxes for home and visiting coaches, security booths and, finally, space for administrative and athletic department leaders. The basement houses food service space for O’Neill and Corbett Family halls, the Duncan Student Center and the stadium. The Corbett Family Hall flanks the eastern wall of the football stadium. As previously mentioned, the Departments of Anthropology and of Psychology are expected to move this summer into the new 289,000 square-foot, nine-story edifice. Its increased space will facilitate more research in such areas as sleep studies. Its seventh floor will feature outdoor club seating for football, outdoor terraces, and a large space that’s used as a club area or flexible classroom. The eighth story will have more outdoor club seating for football. And the ninth or top floor will contain the press box, radio booths and premium indoor and outdoor seating for football. 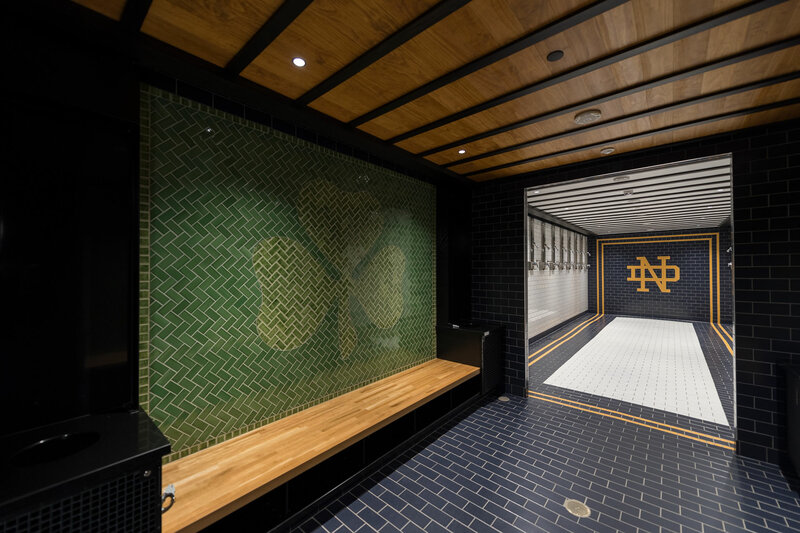 92 oversized displays of historical game covers and tickets depict the tale of Notre Dame football and honor Irish football standouts at Gate C.
This stadium project was designed to cater to three distinct crowds, Missy Conboy, Sr. Deputy Athletics Director, says on the PBS special. There is the crowd who enjoys events from within the bowl, that which experience it from within the buildings, and then the players themselves. The results are a premium, communal event for all. That’s especially indicative in the new seating configuration, which allows a wider range of affordable ticket prices. 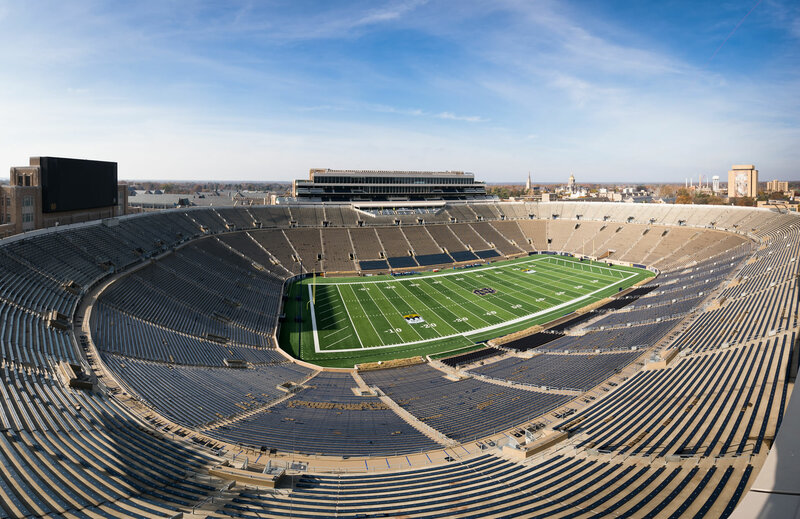 In addition to Notre Dame’s famous football games, its stadium— which sold its first tickets for $1 and had its most recent addition (of seats) in 1996—will now also host concerts and other events. That enables university faculty, staff and students to enjoy it year-round rather than only a handful of times each year. seating covered with blue vinyl, and switching out the chair-back gold seats near the field for new navy blue seats. (Reclaimed wood from the old bench seats now decorates O’Neill Hall, Duncan Student Center and Corbett Family Halls.) While the stadium has technically gained around 3,000 seats, those in the lower bowl have been enlarged by two inches a piece and crews removed the field seats. Therefore actual in-stadium seating has decreased by a couple thousand. The construction projects expand beyond college football. Let’s consider some of the other changes at the University of Notre Dame. Within one new building are Jenkins Hall and Nanovic Hall. They’re kind of like four-story wings conjoined by a three-story central space known as the Forum. Altogether the spaces occupy 185,500 square feet. The Jenkins wing contains the All Saint’s Chapel, a multi-faith prayer room, the Keough School of Global Affairs, and the Mediation Room, a U.N.-inspired space surrounded by observation rooms. The Nanovic wing particularly demonstrates the growth in students’ interest in studying economics and political science. These are now two of the largest undergraduate departments on campus. In fact the departments of Economics, Political Science, and Sociology hired more than 20 faculty members between 2014 and 2017. Therefore they and the Nanovic Institute for European Studies were in need of laboratory and research spaces, classrooms and faculty offices. No longer are the faculty, graduate students and post-doctoral students spread throughout the campus. They are now housed in one building of 92,750 square feet. “[It was] designed to be a hub for intellectual and professional exchange among students, faculty, staff, public officials, diplomats, executives and visiting people of many cultures and backgrounds,” according to ND Works, a university publication devoted to faculty and staff. The second phase of a major project called Innovation Park opened early this year. The 40,000-square-foot Quinn Hall joined the first phase of the Park project, the Judd Leighton Hall. It encompasses the IDEA Center, where Notre Dame works to bring innovative research and ideas to market. The North Dining Hall has undergone its first major update in almost 30 years. Its redesign has increased space for the preparation of allergen-free, vegan and other alternative menu options. Additionally it showcases new and updated mechanical, electrical and plumbing, accessibility for the differently-abled and a modernized kitchen. 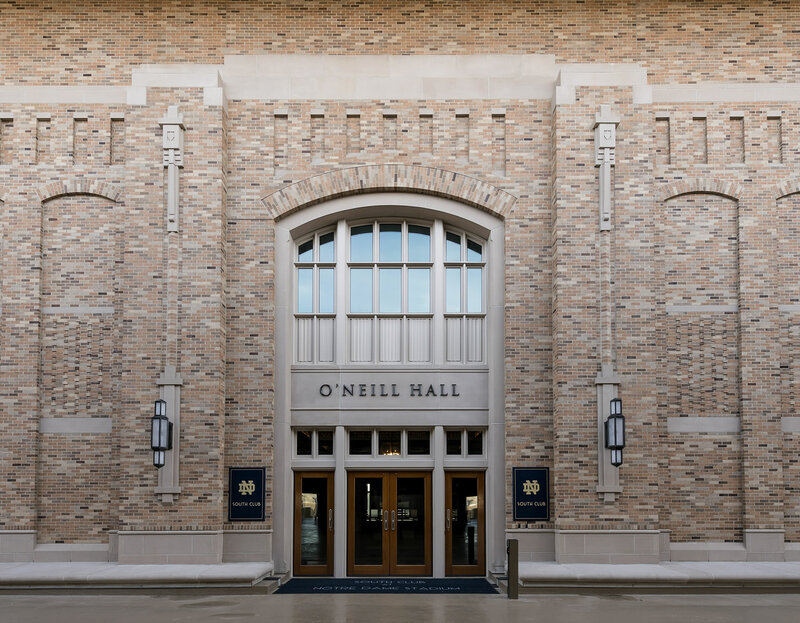 The hall came together thanks to a collaboration of Student Government, Student Activities, Student Affairs, Athletics, and Facilities Design and Operations. At the other end of the tech spectrum was Walsh Hall, a dorm built in 1909. It still bore its original plumbing, light fixtures, sinks, and dated electrical systems until its comprehensive and conscientious update, which protected its charming character. Now the female students living there enjoy up-to-date plumbing and electric, all new LED lighting throughout the dorm, new doors, a repaired roof and ventilated bathrooms. They also have a kitchen and lounge on each floor and a spacious community study area. There are new destination spots at the university as well. Snite Museum of Art’s Charles B. Hayes Family Sculpture Park is one. Designed by landscape architect Michael Van Valkenburgh, it opened in August 2017. The sculpture park stretches across eight acres and features a natural amphitheater with limestone seating. On display are a dozen sculptures by renown national and international artists such as George Rickey, Richard Hunt and Deborah Butterfield. Lighted pathways further add enjoyable elements to the park, which previously served as a landfill. Its water elements, prairie grass and indigenous shrubs and trees hint, however, at how the land might have appeared before Notre Dame. The park is part of a new fine arts district created at the campus’s south entrance. Hence its proximity to the DeBartolo Performing Arts Center and the Walsh Family Hall of Architecture. It will in future welcome neighbors such as a new art museum and a new home for the Department of Art, Art History and Design. Currently it’s located between the DeBartolo Performing Arts Center’s Irish Green and the Compton Family Ice Arena. In keeping with the founders’ missions, the University of Notre Dame has definitely become a powerful force, a force for good. From honoring its history to confidently facing the future, it will enjoy another successful 175 years.